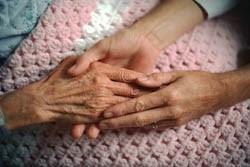 An old man is dying and he is holding the hand of his beloved daughter. Both of them know that his time is near. Tears filled the father’s eyes, “I am not this body. Look at the tree outside. The dry leaves that fall to the earth do not shed tears because they know that they will soon rejoin the tree when their elements are absorbed by the roots. Everything is energy. Energy can never be destroyed but merely changes forms”. The daughter rests her head on her father’s chest. The soft beat of his heart comforts her but she knows that this would be the last time her father will be able to hold her. These words brought comfort to the daughter. She remained silent; absorbing the final words of her beloved father. “My Baby, I am forever with you. Love does not know death. My love will comfort you in times of sorrow; my love will rejoice with you in times of happiness; and my love will forever be your shelter and your shield”. With these last words, the father reunited with the Divine.